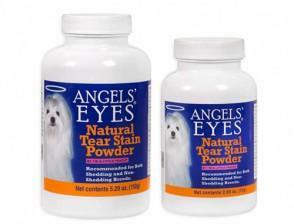 Angels’ Eyes® is developed specifically for BOTH DOGS & CATS. Made with All Natural Ingredients! 100% Wheat, Corn, Soy, and Dye Free. Extremely flavorful! Angels' Eyes Natural contains no harsh chemicals, wheat, corn, soy or dyes and ALL ingredient are listed on the bottle. For optimum results Angels’ Eyes Natural should be used every day, please see the dosage chart below to as to how much product your pet will need per kg. Consult your veterinarian before starting any supplement regime. Please follow the instruction on the bottle/brochure. Angels’ Eyes Natural should be used for a min of 90 days or until the staining is clear. After this treatment you can cut down to a weekly dosage. Angels’ Eyes Natural is a 100% natural complex blend of plants and roots which will take time to enter your pets system, please allow 12 weeks for optimal results. Angels’ Eyes Natural will not remove any existing staining, this will need to be trimmed away or cleaned before you commence your treatment. Angels’ Eyes Gentle Tear Stain Wipes can be used to help with this and to keep the eyes clear after the treatment. Hygiene: Throw away your plastic food bowls. Use stainless steel, porcelain or glass. Plastic food bowls often develop tiny cracks that harbor bacteria and cause facial irritation. Sprinkle Angels' Eyes Natural on your pets food daily to help clear tear staining. Can be used in conjunction with Angels' Eyes Gentle Tear Stain wipes. Angels' Eyes Natural should be used for a min of 90 days and will not remove the existing staining, this will need to be trimmed or grow out with the coat. Angels’ Eyes Soft Paw Moisturizing cream is specifically developed to help protect and moisturize your pet’s rough, dry and cracked paws leaving them soft and smooth. Apply gently by just using your fingertips to apply once a day massaging onto your pet’s paws, there is no washing or rinsing required. Angels’ Eyes Soothing Nose Glow Moisturizer is specifically developed to help soften and moisturize your pet’s nose leaving it beautiful, smooth, with a shiny glow. Recapture your pet’s healthy looking nose by just using your fingertips gently to apply daily massaging onto your pet’s nose. There is no washing or rinsing required. Angels’ Eyes® Hypoallergenic Shampoo is a gentle, soap-free formulation with optimal pH balance. Contains emollients for moisturizing and protein for conditioning. Natural Moisturizing Factors promote hydration of skin and coat, while essential fatty acids nourish skin and aid in the control of flaking and scaling. Angels’ Eyes® Ear Rinse for dogs and cats is a veterinarian-formulated ear cleanser scientifically developed to deodorize, gently clean, dry and acidify the ear canal. A build up of wax, dirt and other substances can result in odors, excess scratching, itching and ultimately ear infections. Ear Rinse for dogs and cats helps to safely clean your pet’s ears and avoid potential problems before they start. Plus, you will love the pleasant sweet pea & vanilla scent! Will not sting or burn and gentle enough for daily use. Ideal for dogs and cats of any age.